I have to move to England soon, because my taxes were an absolute nightmare. DJ Kirkby said that she USED to file taxes in Canada, but now that she lives in England, she doens't have to. So England it is. Besides, my Sweet Pea wants to be surrounded by English accents, so it all works out for the best. The Guy fixed adobe for me though (and my car). So now if I try and open up a pdf, it still shows this picture. But if I make a bunch of unhappy noises and then reload, it magically magically shows me the pdf. If all goes as planned, you will be able to read this and I won't. I'd say why, but that would ruin the mystery and stuff. It mostly has to do with the not-having-internet-thing that I mentioned in my last post. I will read everything soon, when I am reunited with internet! 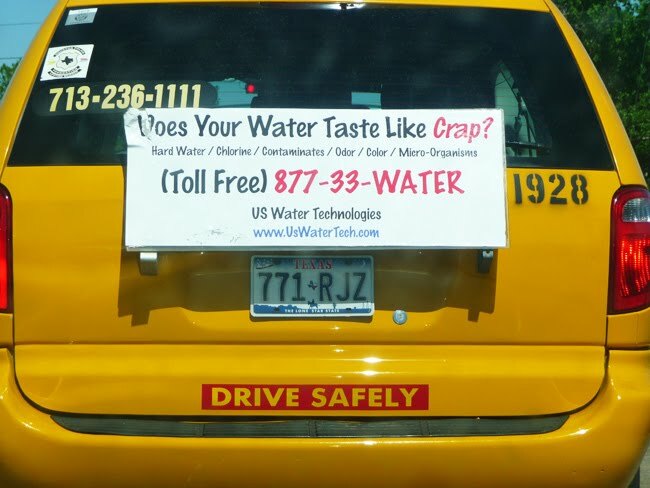 So if one answers the posed question with "Yes, my water tastes like crap" and you call the number and say "Yes, my water tastes like crap" does the person on the other end say "Ha ha! You eat poop! Crap eater!!" and then hang up? Cause that would be hil.ar.ious. What a sweet pic of you! The weird thing is that this picture pops up every time I open a pdf too! Cid - That's probably EXACTLY what happens!!!!!! Hope your tax woes are over, your computer comes around and starts being agreeable, and mostly that your water does not, in fact, taste like crap so you can avoid that awkward call. Thanks Nicki! Actually my computer problems stemmed from being out of the country, but I am now reunited with internet and my water tastes fine, although I understand that there is enough radiation or something in it that doctors discourage pregnant women from drinking it. 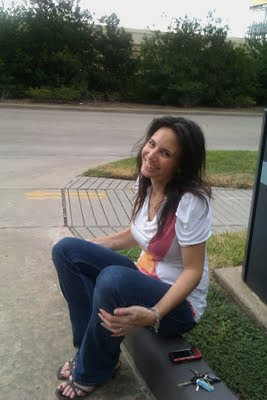 ive never seen anyone looking so happy that their car broke down! Slyde - Well, it wasn't that bad, because I have triple A. Plus, I was in walking distance of a restaurant, so I wasn't going to starve. And I was pretty sure it was the battery, even though this guy that helped me before I called triple A practically blew up the car trying to prove to me that it wasn't. It is a great picture, sitting by the side of the road. I don't think I'd be looking that perky if my car broke down! On the subject of England, I think there are many reasons to move there. Anything spoken with an English accent automatically sounds more intelligent, don't you think??? I think I'd have to start laughing about now.. or I'd be crying! At least you look great. You are such a pretty lady! Laughed when I saw the crappy water sign...heehee! Margaret - It helps to have triple A!!!! And thanks Marlene! I hope you have non-crappy water! I'd love to live in Europe, and taxes are as good an excuse as any! I can't wait for your Israel pictures. Israel is definitely on my bucket list. I say have a blast in England, and hopefully and tax trouble will work out. I would love to go to England, I hope it all works out for you! Sorry your car broke down but I really like that pic of you! And I'm also glad my water doesn't taste like crap lol! It seems that the better they make technology and the internet, the worse it is to use. Sometimes I long for the days of DOS and just text on the screen. As for the sign...I think we as Americans have to high an expectation. When we were kids we drank water out of the garden hose and it tasted like crap, but we loved it, because the alternative was dying of thirst on a hot day. I am moving to Mexico. Seriously, I'd never know your car was broken down by that picture - you are entirely too happy. I don't think there exists a picture of me when my car is broken down because when my car is broken down, I'm not happy and when I'm not happy, there had better not be a camera around because it's liable to be shoved down the nearest esophogus that is not attached to my body. I could think of worse places to live than England. That'd kinda be awesome. My water doesn't taste like crap, mainly because I filter the entire house lol. If you think English accents sound 'intelligent', listen to someone from Birmingham. Maria - I can't wait for my Israel pictures either! I was a little overwhelmed, but I finally decided on plowing through them day by day, so I am almost done getting through day one and then I will have them up! MzCellaneous - Definitely the way to go! Arizaphale - Alabama? :-) KIDDING!